“Which do you like better, Spain or California?” That’s definitely high on the list of things people grill me about in Spain and the U.S. and the U.K., and like any good traveler I have a diplomatic (read: annoying) answer prepared – you know, I like some things better about one country, and some things better about the other. However. That comes with one major caveat. There is one thing that I like better about Spain than California, no further questions, and that’s public transportation. 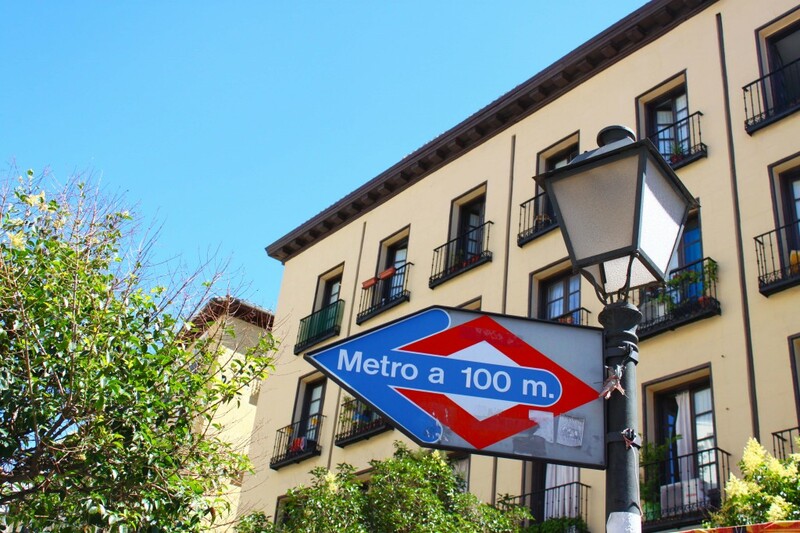 This is a rather snappy metro sign in Madrid guiding you to the very nearby metro station. If only things were the same back home! I’m afraid this week’s Where in Spain WednesThursday has turned into a little rant. While I was home in California over the holidays, I was exasperated by the lack of efficient public transportation options available. I’m not even talking about getting from my suburban hometown into L.A. this time; I’m talking about within the cities themselves. It took me almost THREE hours to get to the airport in San Francisco from my friend’s apartment in The Haight. (Granted, I blindly followed Google Maps and had a few long changes between trains, but in the best case scenario I still think it would have taken a good two hours). And it wasn’t just the time it took that drove me up the wall. Oh no, I’m just getting started. Here’s a rundown of my battles with San Francisco’s public transportation system. I’ve spent most of my life in California and have traveled alone to lots of places (including San Francisco a few times), but I had a really tough time figuring out where I needed to be on the public transportation because there was practically NO signposting. Seriously, how hard would it be to put signs on the station platforms telling you, for instance, which train is coming on that track? Or maybe which direction the train is running in? 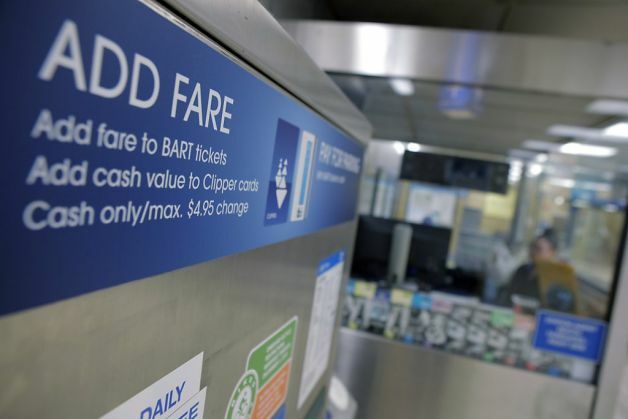 Seriously, who can figure out that to buy a BART ticket you need to put your money in FIRST and gradually decrease the amount by 5¢ by pressing a button repeatedly. How do you find out the actual amount you need? Oh, consult the teeny-tiny chart of stations and fares stuck on a random corner in the station (if you’re lucky, it will be on the machine). Can’t understand these odd machines? You can’t buy a ticket from a real human being – you can just ask them to help you decode this relic from who-knows-what-year. Sooo…how am I supposed to add a fare to a ticket if I don’t HAVE a ticket? Confusing instructions abound on the BART. (Image via the SF Gate). The BART I caught to the airport was, in short, disgusting. The windows boasted signs that the car was “proudly maintained” by some company, but that maintenance must be pretty far down on their to-do list. The seats sagged down about six inches when you sat on them, the furniture and carpet were stained with huge dark gray pools of…something, it smelled funky, and to top it all off I had the luxury of sharing my compartment with a drunk threatening to vomit at every turn of the track. I don’t know why they don’t rip out the carpet if it’s so hard to keep clean. This is really silly, but I could NOT figure out how to pay on the Muni. I saw lots of signs threatening to fine you for not paying, but only when I got off did I realize you had to go up to the driver (who, um, I guess took breaks at stoplights?) and pay. There weren’t signs telling you where or how to pay, nor were there any signs or ticket machines on the station platforms. Still, I’m not going to complain too much about this one as I got a free ride! And of course, there could always be more extensive public transportation, though I suppose that’s asking rather a lot. San Francisco is one of the best cities for public transportation in the United States, but I honestly find it to be not very user-friendly, complicated, and slow. That’s one of my frequent frustrations with California – the public transportation is just not as good as it is in cities I’ve been to in Spain. And it’s a shame, because small changes like signposting stuff could go a long way. I’m absolutely spoiled with great public transportation in Barcelona, and it just takes one battle with California’s public transportation to appreciate it all over again. Yeah, I might be cross that the ticket prices went up for the New Year, but I’m so thankful that I have access to a system with trains, a subway, buses, night buses, and even bikes available for public use. For me, the pull of the open road pales in comparison to the magic of a little train that whizzes you around hidden passageways under a city, then tidily pops you out at your destination a few minutes later. Or even a bus that still runs every 20 minutes at 4 in the morning. P.S. This was supposed to be up yesterday, like usual, but for some reason WordPress wasn’t letting me upload pictures! Hmph. It’s not just California – I’m convinced the metro system in Washington DC is the worst in the world! Coming from Shanghai, where city planners studied the best metro systems in other countries before designing their own, it was really embarrassing to find such a poorly run system in our nation’s capital. 20 minute wait times, maintenance work done on weekends instead of at night, confusing and expensive tickets, the list goes on. Clearly the people who run these systems have never traveled on them. YES, the D.C. metro system is terrible too! I couldn’t believe the wait times between trains, and the stations didn’t seem to be very well-located. It was so frustrating. I live in Washington, DC and you’re absolutely right. Besides the horrendous wait times, the designs of the train are very inefficient. Carpet on floors (gross), and the seats are placed like a bus. It’s much more space efficient to place the seats on the side of the train cars, similarly to NYC. And the stations are too sparsely separated from one another. Urgh the carpet on the floor is such a mystery! It’s inevitably going to get dirty, and carpet is harder to clean quickly and thoroughly with that number of people trampling on it. It just baffles me. I haven’t been to California (except one 7 day trip to SF) but I had to laugh; I went to Madrid for the first time last summer with some friends and we all immediately noticed just HOW MUCH signage there was and it became a running joke during our trip! Haha yeah, Madrid puts up tons of signage! Barcelona does too. It might be overboard, but I’d prefer too much than too little any day. Great rant Jess! We are very spoilt in Europe with our public transport. I’m in South Africa at the moment where it is practically non-existent though slowly developing. You don’t realise what a difference an efficiently run system makes to your life until you don’t have it! Exactly! It really does make a difference, and at least they’re working on it in South Africa. I feel like California focuses on car-related issues like freeways and stuff rather than public transportation when they’ve got a traffic crisis. Either way, we are definitely spoiled in Europe! Caitlyn recently posted…So what’s the deal with Split? Haha I feel the same about the Spanish. It could be so much worse! 🙂 The countdown thing happened to me in San Francisco too. Isn’t Melbourne the city with lots of trams? I saw a friend’s holiday video from an Australian city and I can’t remember if it was Sydney or Melbourne. As much as I don’t care for Madrid or Barcelona (I just prefer Spain outside the biggest cities, that’s all), I am absolutely in love with their efficient public transportation systems, from metro to commuter rail to buses. It’s about a million times better than, say, L.A.’s public transportation, so I’d say it’s true that it’s much, much better than other places in the U.S. BUT it’s nowhere near as good as many of the systems I’ve used in Europe, unfortunately. Seriously! It’s just lose-lose. California has such bad traffic issues that having more extensive, better public transportation would make so much sense. But for some reason we’re stuck with dirty, slow, and often unsafe stuff. So frustrating! You’re definitely not alone on this one. Life in Tokyo for 3 years and the NYC metro system was driving me insane. What’s with all the delays? Why aren’t the employees ridiculously courteous? WHY IS SOMEONE PEEING IN THEIR SEAT? Things here in Seattle are definitely not the best, but I find it’s easier to forgive buses, since they don’t have their own tracks or anything. It’s also a small enough city that I can just walk to many places. I also have a car. ha! Ewww gross! Haha I’ve never had that happen, but I’ve seen people throw up and smoke marijuana on the train at fairly normal hours. Not nice for their fellow passengers (and in the vomiter’s case, not nice for them either), but not as bad as peeing on their seat! But yeah, it’s more forgivable if the city is small enough to walk or bike around. That way you’re not stuck between awful traffic and awful public transportation. I’m talking to you, Los Angeles. It really is amazing. You land in Madrid or Barcelona and there is no need to even take a taxi. I even skipped the expensive taxi ride when I landed in Paris. I love traveling by train all over Spain. Sometimes bus service is better. The only time you have to rent a car is when visiting the more rural areas. Yes, Madrid and Barcelona both have great metro systems. It’s so useful having the trains go right to the airport! 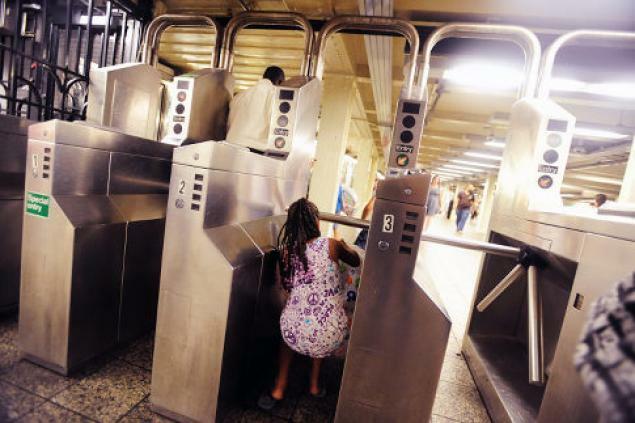 Outside of NYC, I haven’t experienced a decent public transportation system in the US. Not saying NYC is the best city in the world ever, but the subway never shuts down, it runs 24/7. Name another city that does that. Maybe Tokyo? My suburban train line on Metronorth DOES shut down around 2 AM and starts back up again around 5:30 AM and it has had its share of problems this year–electrical failures, train derailments, a system wide shutdown because the main server failed and it left commuters stranded at Grand Central for over 2 hours (luckily I managed to snag a train home before this happened) but it’s usually pretty reliable. Just thinking about the green line in Boston of the T makes me want to scream. Worst train line I’ve ever ridden. 24/7 metro is such a brilliant idea. I would definitely be down for that everywhere! If NYC can get it done, why can’t other American cities? I hope there’s a public transportation revolution in our future! I know when the current administration wanted to invest in infrastructure and mass transit people lost their minds. I guess the US will always be a car culture which is such a shame because travel would be so much better if all states had a good public transportation system. I remember when I was in Spain and my friend was preparing to live in North Carolina for a year. While inquiring about getting around, she was told only poor people and a “certain element” use public transport….this from people in NC (true story),I was floored. Hell I’ll take my NYC public transportation any day. One of the first things I noticed about Barcelona was how efficient the metro system is! I’m currently in Rotterdam and the public transport here is incredible as well. I’m not sure how these European countries are doing it, because Paris is really really good too! I suppose when you’re used to the London underground (rising prices and rubbish service!) anything seems good! Come to Greater Manchester in the UK and you will know public transport hell!! I love public transport abroad and I have no complaints about NYC subway given the hours I have spent waiting in the freezing rain back home for buses to just decided not to turn up or trains to break down because of a leaf on the line!! Daily hell! Even the London Underground, which so many Londoners complain about, is a refreshing change to what we have!! It’s so expensive too as the Trams, Buses and trains are all run by different companies and need different tickets, plus the smelly drunk guy always seems to sit next to me!! The Budapest transport system is one of the best we have experienced recently, but most of Europe seems to have it sussed better than Manchester!! Yes, the Underground sounds like it’s gotten crazy expensive. I didn’t know Manchester’s was bad as well; last time I went, we’d rented a car so I didn’t use it. Everyone just needs to go to a European city with good public transportation to see how great of a thing is it! That was a great rant and even though I agree with you on a lot of it I have to stand-up for my city. San Francisco has its issues for sure and cleanliness and safety on some of the Muni lines are huge but in general I find BART to be a pretty well oiled, on time, machine. It has signs everywhere and they let you know when the train is coming, how many minutes away it is, and how many carriages it has. Muni has timers as well but as you pointed out they can show arriving and then all of a sudden go back to 10 minutes, oy! Nothing compares to the efficiency in Europe. I’m willing to believe I just had some bad luck with the BART! Maybe I got one of the few stations without signposting. But yeah, Europe’s public transportation is just crazy efficient. Fantastic article and I completely agree with you! This is not to say all public transport in the States is bad (though Greyhound is AWFUL!) however LA is notably terrible. We had to rely on taxis to get around – lucky we were in a group so could split costs otherwise it would not make for a great budget experience.